My kids love kidney beans. When I was introducing solids to my first born I was very cautious. I was so afraid he would choke on things that I took it painfully slow. And he really wasn't interested in meat for awhile. (the joys of chicken nuggets and hot dogs as staples in our diet, didn't come until his was older) My pediatrician suggested I give him kidney beans. She said they were a great source of protein and they were soft and chewy so I didn't have to freak out about him choking. He loved them! While the other kids at playgroup were snacking on normal finger foods like goldfish or PB&J, my son would sit with a container of kidney beans and eat them by the fistful. (Yes, I was mocked for this!) When my daughter came along I introduced them to her as well. 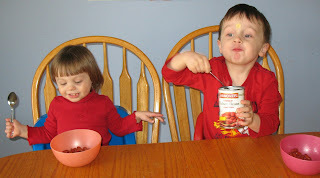 If Daddy has to work late and isn't home for dinner, they are quite content to split a can of kidney beans. As you can see in the picture, they eat them right out of the can! No prep work needed. How easy is that? At one of our playgroups when the kids were chowing down on kidney beans a friend of mine asked if I had taken any pictures of this phenomenon. She insisted that I had to document this! One night when I served pizza for dinner, which at the time my daughter did not eat, I gave her beans instead. When my son saw this, he begged to have beans too. Beans over pizza, are you serious? Are you really my children? As my son has gotten older, his love for the musical fruit has diminished some. He'll eat them, but he'll tell me first that they are not his favorite. My daughter however, still delights in them. When I announced their lunch today she exclaimed, "Yea, beans, yea!!" great job crystal! it is so fun to be a part of your life this way. it makes it feel less like there are so many miles between us. love you! What would you have done over these years without BEANS!! !